Do you struggle with where and how to best use the limited time you have to blog? I know I do. I set aside at least 3 hours a day to work on this blog and other smaller niche blogs I have, but I do sometimes struggle with how to best spend those three hours. Blogging includes lots of activities and prioritizing where to spend your time can be difficult. Even though I still struggle at times, I have developed a priority list that I often refer to when struggling with where to spend my time. Now, with that said, there are days when I sit down to spend my time, and I don’t feel like writing and I’m in the mood to say tweak my site’s design. Other days my brain is just full of article ideas, and writing is at the top of my mind. By all means, if you’re hyped about doing something or “in the zone”, just do it. I’ve said it many times here on Side Income Blogging, and will say it again: Content is your main product and without content, people won’t come to your site. Creating great and valuable content is key to you blog’s success and should be your very first priority every single time. A couple of years ago, I actually had a client ask me: Would you rather have a great looking site with okay content, or a okay looking site with great content. I would rather have an okay looking site with great content every single time, assuming of course the site is readable. Tip: Focus on the content you are more comfortable with, but don’t be afraid to branch out and try new things. I’m far more comfortable writing content, but I have recently tried doing some video both by myself and with another blogger. I was surprised to find I actually enjoyed doing video. Social Media – Google+, Twitter, Pinterest, Facebook, Instagram and LinkedIn are a few of the big ones and new social media sites are emerging almost daily. Forums – Active participation in forums within your niche can be a great way to share your content, build relationships and market your site. Leverage relationships – This is tightly coupled with social media and forums, but make sure you are leveraging the relationships you are building and work with those friends and associates to find win/win situations that benefit both of you. The key to successful blog marketing is to not only share your blog and posts, but provide value to the community and people you are interacting with. Don’t just spam links to your posts and content, you will not be successful and you will do nothing but kill your brand. With all of the various social media sites, you can literally spend your whole day on them all. Find the one’s that work best for you, meaning the ones that provide the most engagement value, and traffic. Focus on those. For me, it’s Google+. Don’t get sucked into social media. Wasting time on social media is far too easy. Login, do what you need to do and get out. I might even suggest setting time limits for yourself. Traffic from search engines can be a very valuable traffic source for you, especially given that most income from ad clicks comes directly from search engine visitors. Many people focus solely on search engines as the primary source of traffic. As someone that has learned the hardway, this isn’t a good plan. Google changes their algorithms often, and relying on consistant search traffic is a huge risk. I prefer to diversify my blogs and that includes diversifying my traffic as well. SEO should just be one portion of your overall traffic and time strategy. To get search engine traffic to your site, you need to spend time writing on topics that people are searching for and then optimize your articles for search engines. Tip – Always write for your readers first, then circle back and tweak your articles for search engines. Nobody wants to read and article that is keyword stuffed and written 100% for search engines. Google is onto this strategy as well, and in the long term it will hurt you. Just say no. Of course this is just a few ideas, there are thousands of product ideas out there. Receiving promotion and traffic from other websites that make their readers aware of your product. Traffic can be huge if you create a very successful project. Offering an affiliate program for your product will encourage others to promote it. Products can take a very long time to develop, and are a bit risky. Spending a large amount of time on something that may not be successful hurts, especially when that time could have been spent elsewhere and generated more visibility. This is why I haven’t spent the time to create a product … yet. New bloggers are often very surprised to find out how much time it really takes to create, run and grow a successful blog. While I don’t have any specific numbers on percentages of blogs that are started but abandoned, I can tell you that from personal experience the rate is pretty high. Just in the last 6-months, I’ve seen many blogs started. The bloggers write like crazy for a few weeks, then just stop and disappear. Sad really. Blogs require a lot of work, and subsequently a lot of time. The more time you put in, the more you get out. Many of us, especially those of us blogging on the side, have very limited time. Prioritizing your time and focusing on the items that bring the most value for that time investment is critical. The list above helps me determine where to focus, and hopefully will help you out as well. Bottom line though, if you are struggling with where to spend your time, you can never go wrong by creating great and valuable content. Also, this list works for me and my blogs. But if you find other items or even realize that items lower on my list, provide more value for you, than by all means move them up. 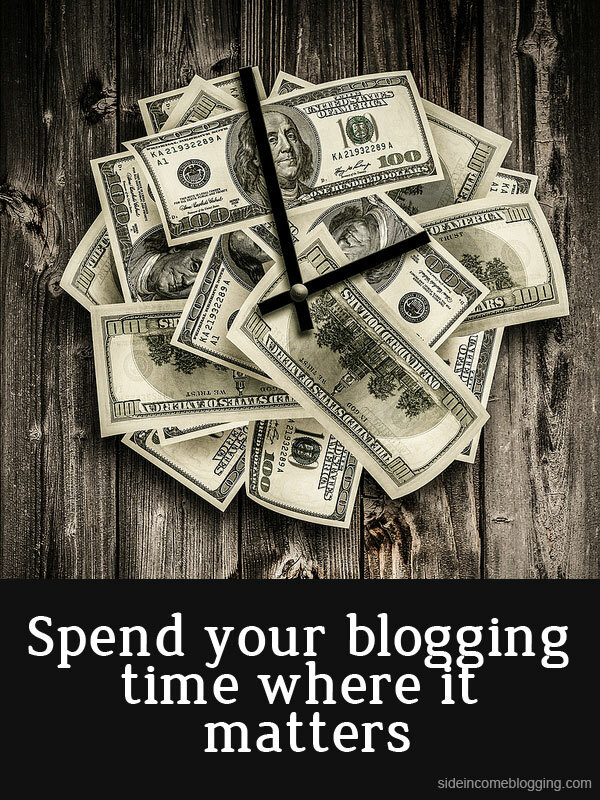 Spend your blogging time where it matters most for YOU! Larry, I am addicted to everything blogging and because of that I constantly find myself staring at my blog thinking of ways to make it better. Your tips are helpful. I need to get schedule. If I did things on a timed basis it would be easier. Blogging is so big that you have to conquer task you have no knowledge in order to do well. I thought that I mention an observation about blogging… You should take time to research what you intend to blog about. This helps to ensure that you add value for your readers and keeps them coming back for more. You have described here a good point that every New blogger must know. we create blog in potential but we failed to maintain it. We have do consistent work and planning for that. Thanks again for sharing a valuable post . Larry, your blogging advice is invaluable. I really appreciate all your insight and help. I’m going to get some guest contributors to help with my content, and also conduct some interviews of interesting ballet dancers and teachers. I like how you have lots of links in your blog content too. Linking to other sites and even to other posts on your own site–great stuff. Hours go by quickly doing this, and setting up some time constraints would probably be a good idea for me. But first, I have to go look up Slideshare! Larry, the shy type, the kind who doesn’t like being on the spotlight is trying new things for the love of blogging. An inspiration, I must say, because you’re not the only one struggling with this difficulty of going after these new blogging techniques. Seeing you and reading how you are doing it all is amazing. Michael – I am as well. I really have to be careful to not waste my time on things that don’t matter. It’s very easy to get distracted. Great tip Gary, and dead on. In my Start a Money Making Blog series, that is one of the first steps I walk people through. Thank you so much Tammy, and very glad to hear it’s helpful. Internal linking and external linking not only provides value to your readers, but has significant SEO value as well. Definitely a “win/win”. Larry, great article. I found myself thinking about how often I relate to a lot of the points you bring up. I’m finding more and more that having a checklist or system in place, as you’ve discussed, greatly helps in keeping me on track. The other thing I’m learning is to slow down. What I mean is that I get so excited about a topic and want to hurry up and post it to the world and that’s when I find all sorts of mistakes or other necessary edits. Again, great article and good resource to use for reference. Thank you for sharing.